When the Maryland Historical Society (MHS) announced they would be taking proposals to choose a new Poe Toaster and holding a competition in the manner of American Idol and America’s Got Talent, I was excited to see what my fellow Baltimore artists of theatric bent might come up with. As has been described ad nauseam here and in other Baltimore publications, the anonymous, confusingly named, and awkwardly imagined Poe Toaster was once a Baltimore institution, a man (or woman) who appeared at the cenotaph of Poe, on Poe’s January 19th birthday, for 75 years, and honored the dead writer with three roses and a glass of cognac. Having written previously about the MHS Toaster contest, I felt I would be remiss not to attend the event and follow up with a reportorial post. So at the appropriately haunting hour of 9:30 PM on a moonlit Saturday night, I walked through the MHS’s open doors and was directed to the museum’s auditorium. I must applaud the MHS for offering free admission, three-dollar beers, four-dollar wines, and twenty-dollar tickets for all-you-or-I-could-drink: my beverage of choice being a tart and tangy apple juice and cognac mixture. I must also laud the finger bowls of snacks: pretzels and M&Ms, plain and peanut. Having soaked my brain in cognac and apple juice and stuffed my pockets with pretzel sticks, I entered the auditorium. There the MHS had arranged a foam cenotaph on one side of the stage and a fake wrought iron gate on another. Over the gate, an MHS prop-manager had placed the token prize, a handcrafted red scarf. Scarf aside, everyone knew what the evening’s real prize would be: a chance to replace the old Toaster and perform a new three-minute toasting ritual at Poe’s Westminster Hall gravesite. I should relate however that unlike the old Toaster, the new one will perform his or her toasting duties on January 19th during daylight hours and also at additional as-yet-to-be-disclosed locations about the city. As the auditorium filled in, I’d like to say that the Baltimore performing arts community came out in force, but I don’t know much about the Baltimore performing arts community—I spend too much time slaving over these blogs to accept free tickets to the theater. But I will transmit that none of the familiar faces so much associated with Poe were present: no specters with the pedigree of a Vincent Price, Christopher Lee, Christopher Walken, or John Cusack. I would have especially thrilled to see Baltimore native and Buddhist John Astin, now 85, who has performed Poe on past occasions, taught acting classes at Johns Hopkins University, and, if I might digress, scared the hell out of my toddler self as Gomez in the 60s television production of the Addams family. So who was there? First off, the MHS estimated the crowd-size at about 100 necromancers. Additionally, I counted a panel of three judges, an assemblage of Poe experts who certainly know more about Poe and adapting Poe works to dramaturgy than Poe himself. These included celebrity judges Jeff Jarrow, a tour guide at Westminster Hall who was said to have witnessed many a visit from the original Toaster; Susan Rome, a local performer, playwright at Center Stage, and television actor; and David Gaylin, a student of Poe, member of the Maryland Historical Society, and the author of Edgar Allen Poe’s Baltimore. 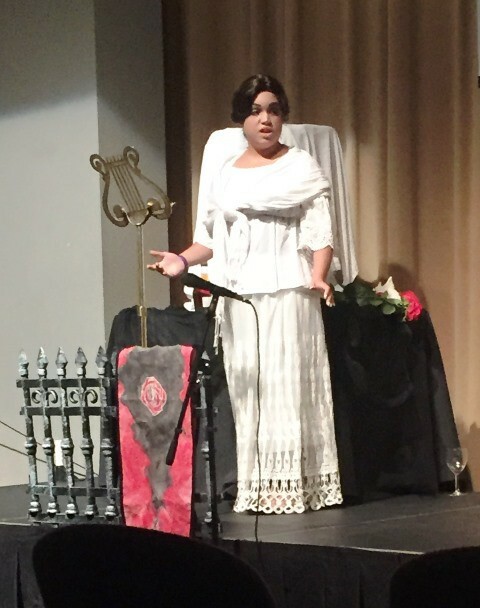 Sitting in for Ryan Seacrest was Jenna Rossman, assisted by Sarah Gretchen Heiderman, both of whom are currently appearing in The Mesmeric Revelations of Edgar Allan Poe, an “immersive experience” at the Enoch Pratt House. So let me describe a few of the evening’s highlights. 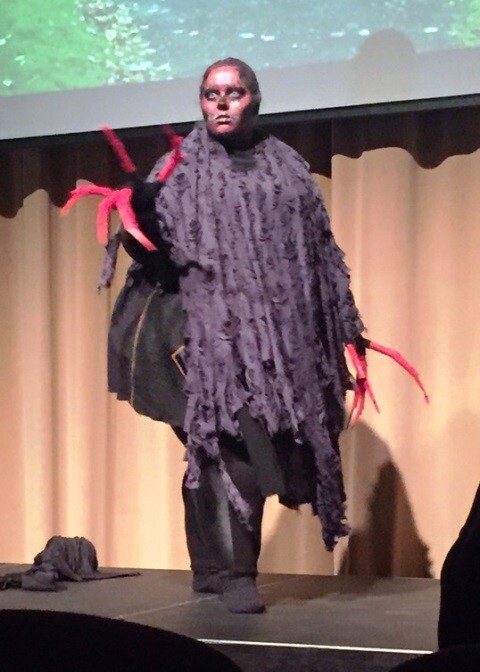 An early favorite in the contest was The Ghoulish Wife. She appeared in black robes but then discarded these for what seemed to be a white wedding dress. During the changeover, she descanted a haunting melody in a lovely voice that must have been operatically trained. Another young female talent, Death, appeared in gory red and black grease paint, black robes, and donned some incredibly well-crafted ruler-length, red finger extensions, which Judge Jarrow described as looking like crab claws. Death recited a mournful elegy, but a little too softly, and thus earned scowls from the judges. My personal favorite was Catarina del Monte’s contribution, an illustrated three-minute film based on The Fall of the House of Usher. One might envision this film projected on an exterior brick or interior plaster wall of the Westminster Church, but the judges seemed to prefer live performances. As to the wild cards, these participants were obviously inspired by their love of Poe to rise from their seats like religious converts, take the stage, and make their devotionals. Of the two who took to toasting, the audience was most taken by a gentleman in tweed who must have been an English teacher. He addressed the foam cenotaph with a heartfelt thank you to Poe for writing poems and short stories, which unlike Ralph Waldo Emerson’s essays, did not bore his students to death. After each of the performances, the judges weighed in, and the audience, at first taken aback by some judgy pronouncements, soon concurred. Early on, it became clear that the judges had a specific Toaster-type in mind. For one, they wanted to honor the memory of both the Toaster and Poe. Second, they wanted the winning performance directed toward Poe’s cenotaph rather than any audience that might assemble to watch. Third, they didn’t want any piped in soundtracks: the explanation being that the music could not be heard above the din of Westminster’s adjacent street and sidewalk noise. This is what Death looked like on Nov. 7, 2015. Most importantly, however, it became clear that the judges were interested in treating the event with as much sincerity, respect, and gravitas as possible. Those who might have wished to present camp, kitsch, or ironic performances need not to have applied. My guess is that the judges weeded out these types of acts early when reviewing the original proposals. 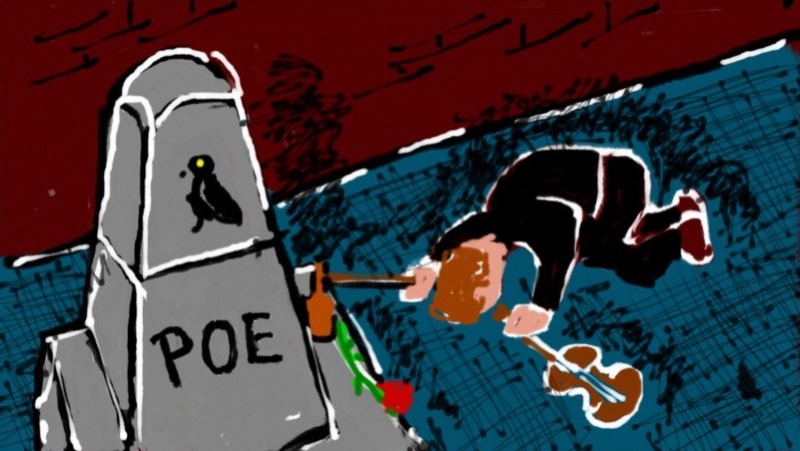 Understandable I suppose, since less than 166 years have passed since Poe’s death, and we should hope to attain a more charitable distance from that sad day before cracking wise at his expense. Based upon the above criteria, the audience voted Nemo Outis the winner. Outis seemed to encapsulate all the items the judges desired. Outis appeared dressed as the original Toaster: black coat, black hat, white scarf. Also, as the original Toaster had done, Outis placed three red roses at the foot of the cenotaph, then poured himself a glass of cognac, and made his toast. There were, however, a few added touches, the primary one being a truncated but virtuoso violin performance of Saint-Saens “Danse Macabre.” Outis also added a white rose to the three red ones and incanted several Latinisms, which Poe might have understood, but which left the audience audibly munching their pretzel sticks. Outis then took his violin and exited stage left. As Outis received the winning red scarf and the chance to take his show to the tomb, the weary late-night crowd stretched their legs, and I approached Judge Gaylin to ask if the new Toaster would be serving a lifetime term, as had his predecessor. The judge said that the MHS would choose a fresh Toaster next year and each year after. That being the case, I believe future Toaster aspirants should take note. If you’re interested in the post of Toaster, study what the tastemakers, judges and public alike, approve. A present-day Toaster should honor the spirit of the old Toaster and Poe, but amend the ritual with a few classy flourishes. Most important, the new Toaster should bury all thoughts of a kitsch or completely original presentation, because as we all know, if there’s one thing the master of the macabre and the inventor of detective and horror genres would not abide, it’s an elegy, the artistic presentation of which, breaks new ground. This entry was posted in Baltimore, Edgar Allan Poe, Satire, Uncategorized and tagged Addams family, apple juice, cognac, Dance Macabre, John Astin, Maryland, Maryland Historical Society, Poe Toaster, Rod Serling. Bookmark the permalink.